February 9, 2019 - U.S. production of refined coal, which is coal that has been processed to reduce emissions when burned, reached record highs in 2017, and it is expected to increase even further in 2018. Use of refined coal has increased despite the general decline in total U.S. coal consumption since 2008. For the first three quarters of 2018, EIA estimates that refined coal production totaled 121 million short tons (MMst), which is 21% of the total U.S. coal production of 563 million short tons. According to EIA estimates, refined coal’s share of total coal tonnage consumed for U.S. electricity generation will have increased from 15% in 2016 to more than 18% through October 2018. 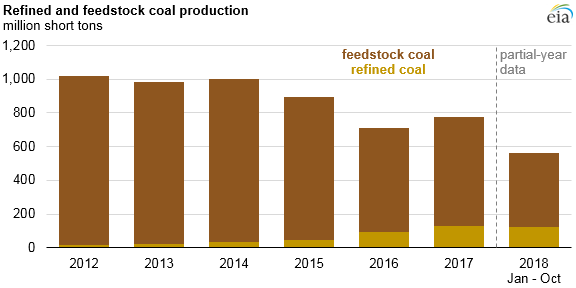 EIA began collecting data on generation from refined coal in 2016. Refined coal generated more than 235 million megawatthours (MWh) of U.S. electricity in 2017, or 20% of net coal generation, an increase of 2% from 2016. EIA estimates of refined coal through October 2018 suggest an even larger increase in refined coal use to more than 22% of total coal generation. Refined coal is most commonly made by mixing proprietary additives to feedstock coal. These additives increase the production of mercury oxides, which can then be captured by using mercury emission reduction technologies such as flue gas desulfurization scrubbers and particulate matter control systems. Refined coal production qualifies for a tax credit under the American Jobs Creation Act of 2004. To qualify for the refined coal tax credit, producers must have a qualified professional engineer demonstrate that burning the refined coal results in a 20% emissions reduction of nitrogen oxide and a 40% emissions reduction of either sulfur dioxide or mercury compared with the emissions that would result from burning feedstock coal. The tax credit was designed to increase with inflation and was valued at $6.91 per short ton produced in 2017 and $7.10 per short ton in 2018. EIA surveys show respondents continued to add refined-coal burning plants even as older conventional coal plants retire, with 36 new refined coal plants coming online from 2016 through October 2018.